Walter T. Darden, Class of ’25. 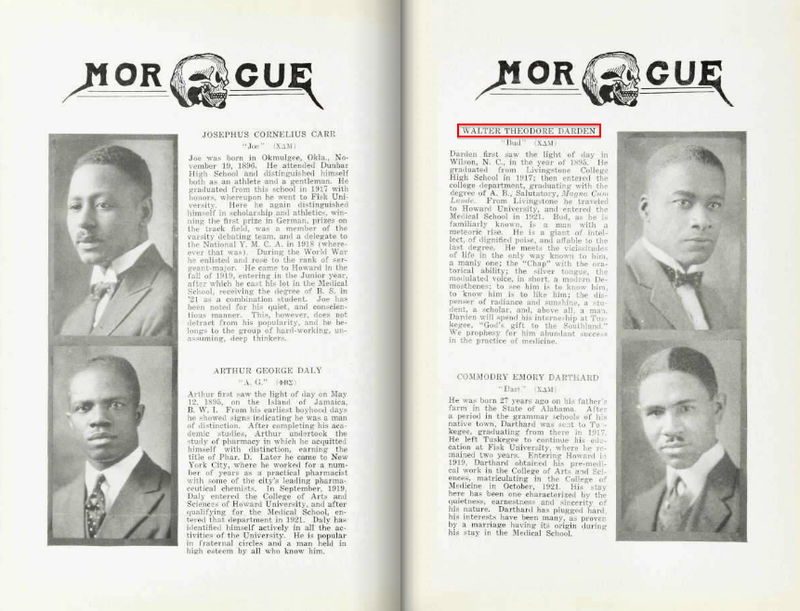 The Morgue (1925), Howard University. Yenser, Thomas, ed., Who’s Who in Colored America, 6th ed. (1942). Dr. Walter L. Darden, a family physician for 60 years in the Central Ward of Newark, died Saturday at Beth Israel Hospital in Newark. He was 90 years old and lived in Montclair, N.J.
Dr. Darden, the son of a former slave, was born in Wilson, N.C. He was an alumnus of Livingstone College in Salisbury, N.C., and of the Howard University Medical School in Washington. He moved to Newark to join a colleague and stayed on in private practice. Surviving are two daughters, Norma Jean and Carole Darden-Lloyd, both of Manhattan, and a grandson. New York Times, 17 February 1986. 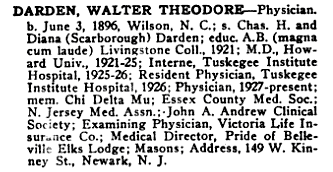 Walter Theodore Darden (1896-1986) was the son of Charles H. and Dinah Scarborough Darden. His daughters Norma Jean and Carole wrote Spoonbread and Strawberry Wine: Recipes and Remembrances of a Family (1978). ← … whether they are paupers or not!